Overview: Pergamon, a site in present-day Turkey, was excavated in 1878 by the Royal Museum of Berlin. Your goal as an archeologist is to get research funding, excavate fragments of artifacts, and assemble the most valuable (i.e., oldest) exhibits for the museum. Rating: Excellent! A bit tricky getting the rules but great once you get going. Who Will Like It? Pergamon is a mix of resource management, gambling, collecting, and timing — perhaps like real archeology, but with less actual dirt. It definitely requires a bit of thought and strategy, but the theme may appeal to folks who aren’t interested in battles and fantasy. 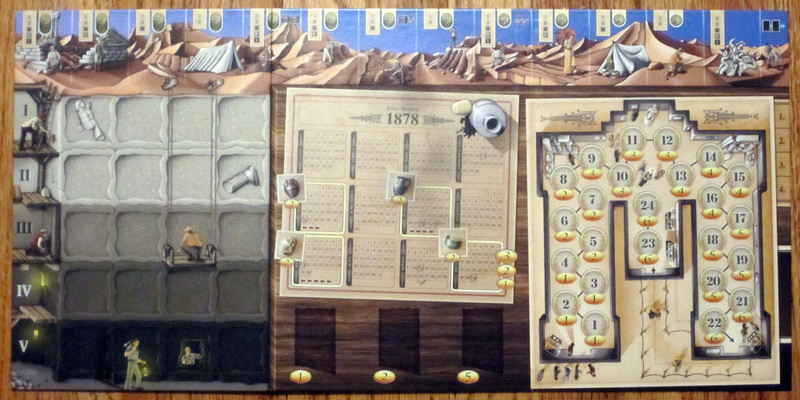 Pergamon‘s board goes a long way toward helping you imagine the dig site. The game can be fairly complex, with a section for excavating fragments, a section for storing it, a section for getting research funding, and an area for calculating the value of exhibits. However the board breaks all this up nicely into sections that become intuitive and are nicely illustrated. 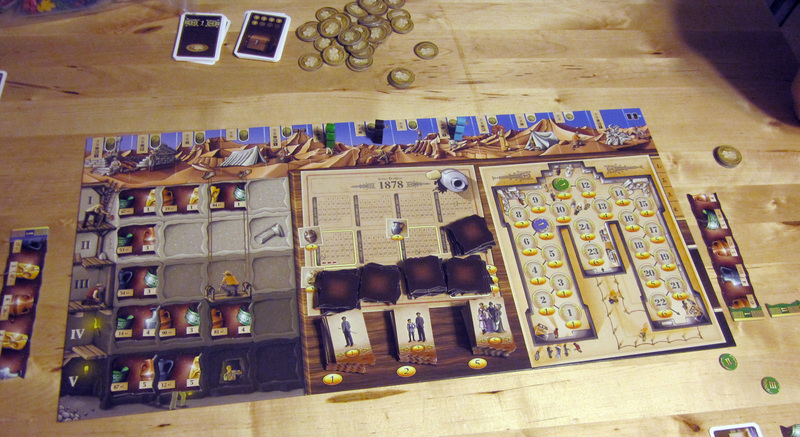 Of course, it’s hard to simulate digging up actual artifacts with a board game, but Pergamon still does a nice job. The oldest items are in the deepest galleries, which are the most expensive to excavate. New exhibits cause visitors to lose interest in the old exhibits, which bumps them down in value. It’s a nice way to capture the theme of archeology. Pergamon board without pieces. Click to enlarge. The game board is nicely done — it’s pretty wide, but it does a good job of organizing what could have been an unwieldy game. The markers, coins, admission tickets, and artifacts are all cardboard tokens that you’ll need to punch out. The quality is pretty good. The admissions tickets are a bit larger than they really need to be, but they look fun. Really I only have two gripes about the components. First, the reminder cards are supposed to show you some important steps during the exhibition that it’s easy to forget, but they’re so cryptic as to be pretty useless. In fact, if you understand what the reminder card is telling you, chances are you don’t need the card. Secondly, because of the way the jugs are colored (that’s the grey/silver one you see in the photo below), they don’t actually look like the same artifact when separated. (Look at the far left on the top row and the far right on the bottom row.) Once you’ve started playing you realize that there are only four types of artifacts, but the first few rounds I kept looking for the other halves of a black jug and a silver vase. The artifact tokens are shuffled and placed in stacks of five on the “calendar” in the center section of the board. The research fund cards are shuffled, and each player receives their player token, three circular markers, and three angular markers. The first player takes the first available stack of finds from the calendar and reveals them. They are placed in the galleries on the left section of the board, with the youngest artifacts nearest to the surface and oldest farthest down. You’ll note that each tile has a year on the left and century on the right in “A.C.” which stands for “ante Christum Natum” (rather than B.C. ), so the higher the number, the older the artifact. This is the part of the game that involves a little bit of gambling. The top two funding cards are set out face down. The backs of the cards show either a money bag or a chest, indicating the approximate value of the card. Bags are worth between 1 and 4 coins, and chests are worth between 5 and 8 coins. The players take turns placing their figurines on the track along the top of the board. Each space indicates how many coins the player would like to receive and which galleries they can excavate from on this turn. At the far right is a space requesting no coins but excavating in any of the five galleries. Then there are two spaces each requesting from 1 to 6 coins, with varying galleries that can be excavated in each space. Once all players have placed their figurines, the funding cards are revealed. Starting with the rightmost figurine, each player receives the coins they requested until the funding runs out. However, the player farthest to the left will get whatever remains. Player who asked for less will usually get what they asked for, but players to the left could wind up with either very little or even more than they asked for. The player positioned furthest to the right goes first, and then play follows the order of figurines from right to left. Excavating and exhibiting are both optional. To excavate, you pay money to take all of the artifacts in one gallery. Gallery I costs 1 coin, Gallery II costs 2 coins, and so on. You may only excavate to the depth indicated in the funding track, and only as much as you can afford. To exhibit, you must piece together your artifact tiles to form whole objects. You can string as many tiles together into one collection as you want, as long as they all match up, and you may have up to three separate collections at any time. The value of your collection is calculated by adding up the century numbers for the assembled objects. (In the photo above, the top collection “I” is worth 15, and the bottom collection “II” is worth 6. The incomplete objects at either end do not count toward the collection.) If you already have three exhibits and want to place a new one, you can break up an existing exhibit — the tiles are discarded. When you exhibit, you may also “polish” your exhibit by adding up to 3 coins to increase the value by up to 3. (During the last round, you may spend as many coins to polish as you want.) Place an angular marker next to the line of tiles to indicate that you are exhibiting — you may not change or add to this collection once it’s exhibited. Then you place your matching circular marker in the museum (the right section of the board) on the circle that matches the value of your exhibit. All exhibits of equal or lesser value get bumped one space down. If a collection is bumped out of the museum entirely, it is broken up and the tiles are discarded. Finally, you collect 1 victory point for placing an exhibit into the musem. For any tiles you have that you do not exhibit, you must pay for storage. The first three tiles are free, and then thereafter 1 coin pays to store three tiles. (So if you have 7 tiles, you must pay 2 coins — the first 3 are free, the next 3 cost you a coin, and the last 1 costs another coin.) You may also choose to discard tiles to reduce storage fees. The calendar indicates when the evaluations take place, after rounds 5, 7, 9, and 12. During each evaluation, you receive as many victory points as indicated under the spaces where you have circular markers for your exhibits. For instance, collections with values from 1 to 4 are worth 1 victory point; collections worth between 5 and 8 are worth 2 points. Of course, what matters isn’t the initial value of your collection when you first placed it into the museum, but the current value — so if it has been bumped down by more valuable exhibits, it may score fewer points. Also, at each evaluation there is one type of artifact that can earn bonus points (also pictured on the board). At the first evaluation, the exhibitor of the oldest vase receives 2 extra points. At the last evaluation, the exhibitor of the oldest artifact in the museum gets 3 bonus points, the next oldest gets 2, and the third oldest gets 1. Also, after each evaluation, all of the exhibits get bumped down a certain number of spaces. The game ends after the twelfth round. In future rounds, the player who went last during the previous round goes first, and then placement continues in clockwise order. I’ve tried out Pergamon with both two and three players, and I’ve really enjoyed it so far, despite the fact that I keep losing. It turns out that I’m very bad at the gambling portion — when I go for a lot of coins there isn’t much funding and I don’t even get what I requested; when I play it safe and don’t ask for much, there’s a lot of funding and somebody else gets a windfall. But that placement of your figurine is crucial: do you ask for less money but get to dig first, or do you go for the cash, knowing that other players may take the artifacts you’re after? Another big part of strategy is knowing when to exhibit. Getting an exhibit into the museum early can mean that it scores several times during the evaluations, but unless it’s a whopper of a collection it also gives the other players a lot of time to bump it out of the museum entirely. Knowing when it’s worth it to pay the storage fees and when to just turn in an exhibit can have a big impact on your score. Also, just digging up an artifact with a 5th century fragment on it isn’t enough — you’ve got to find a matching piece to make it worth anything. So it’s not just about digging up the oldest gallery each time, but trying to find a long chain of objects that you can string together into one collection. The tomb raider in the two-player game works extremely well for throwing in a third “player” that can interfere with your strategy. It’s nice that you can always tell exactly what the tomb raider will do, but then you have to figure out how to work around it. If you see that he’s going to dig up the gallery you want, then you have to request less funding in order to get your turn before him. But since he never asks for a lot of money, that means sacrificing potential funds. Overall, Pergamon is an enjoyable game that has a lot going on. The first time you play it will probably take more than the advertised 45 minutes to get the rules straight, but then once you get going it does play pretty quickly. I like the combination of gambling with tile-collecting, and the research funding mechanic is downright brilliant. 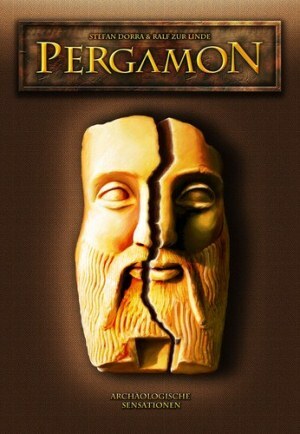 Look for Pergamon at your local board games store, or order directly from Gryphon Games or through Amazon. Wired: Excellent gameplay, well-organized board, great use of tomb raider for two-player games. Tired: Reminder cards aren’t very useful.